With its colorful cast and proclivity for wild plays that are equal parts tactical and mechanical, Overwatch is brimming with esports potential. Problem is, it can be a mess of exploding mechs, screen-engulfing ghost dragons, and middle-aged men in Scream Halloween costumes—too much of a mess, sometimes, to actually sit down and watch. Thank goodness for the new spectator tools. After the expected (but still exciting) conclusion to the weekend’s Overwatch World Cup, I spoke to BlizzCon attendees in the audience about how easy it was to understand what was going on in the game. For the most part, they said, the new spectator tools—which include team-specific character skins and attack effects, snazzy instant replays, a better third-person camera, and a top-down map for broadcasters—were a life-saver. Team colors, especially, stole the show. “I think it’s been massively improved in terms of team colors and how you view things,” said an attendee named Natalie who’d watched a fair amount of pro Overwatch previously. Before this weekend, characters just wore their normal skins, and the only way to differentiate between them was red and blue outlines and UIs, which would sometimes switch over the course of matches, only adding to the confusion. “It’s much, much easier,” Natalie said. Fans did note that the specific color choices aren’t perfect yet, though. “Sometimes there was, like, a light-blue team versus a white team, and it got a little hard to see,” said an attendee named Matthew. There is, however, still a 400-lb gorilla from the moon in the room: how do you involve viewers who aren’t diehard Overwatch fans dedicated enough to travel to an arena in Anaheim? 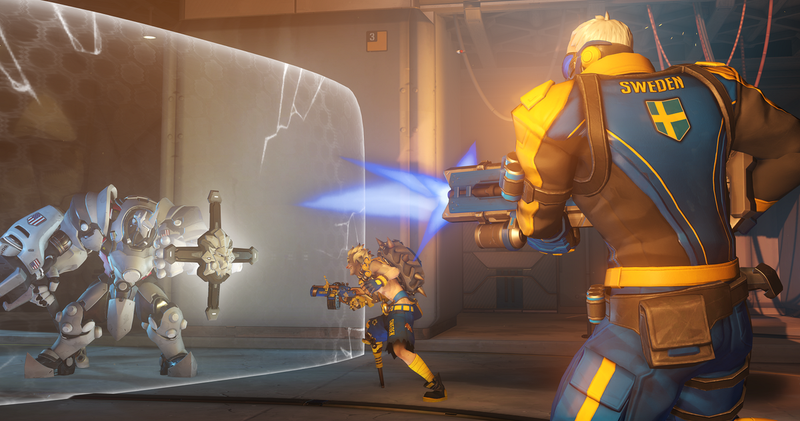 “I feel like somebody who doesn’t play Overwatch is still gonna have a hard time, because it’s really fast-paced,” said Matthew. After the show, I spoke with Gloria, an attendee who went into the Overwatch World Cup with very little knowledge of the game, and she said she was mostly able to figure it out, though it took some time. “At first I was completely lost,” she confessed in an email, “but the UI helped me figure out the system eventually.” She went on to give a succinct but accurate description of Overwatch’s rules. “It took me around four or five matches to figure it all out on my own,” she said. There’s also the problem of Overwatch’s pace, something even a more polished set of spectator tools might not be able to entirely alleviate. Taylor Adams, an attendee who actually works for an esports organization called Tempo Storm, explained that he would frequently lose track of the game if his eyes stopped following it for a second. Picture-in-picture replays, especially the newly added slow-mo variety that allow casters to break down complicated plays, help, Adams said. But Overwatch still doesn’t provide enough information for people to casually follow along. You’ve gotta stay dialed in. Despite concerns, however, everybody I spoke to said they enjoyed themselves, and they all added that they’re now planning to watch Blizzard’s soon-to-kick-off Overwatch League—some more casually than others.